Cassidy’s has been moving goods for over 100 years, and we know our success is because your belongings are as important to us as they are to you. It’s also the “little things” that are actually a big help. We provide fast response times when you contact us. We provide free estimates and a shipment tracking service. We even help you with the paperwork on US and other international moves. You can read our complete history here. We’re also A+ rated by the Better Business Bureau. If you want to ship it by truck, Cassidy’s has unmatched expertise in a wide variety of shipping options to any point in North America and around the world. Cassidy’s literally moves anything, anytime, anywhere. Here is a list of some of the services we provide. Household moving – locally and long distance. Office reorganization and in-house moving services. Inventory management and just-in-time delivery. Climatized warehousing – commercial and residential. Blanket wrap and customized crating. We even have the expertise to ship dangerous, restricted and sensitive materials. Our fleet is large and versatile, and we also partner with United Van Lines for some of our international moves. 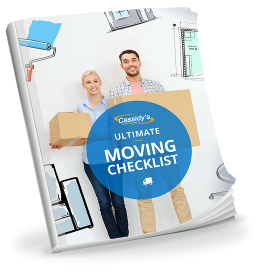 Unlike moving brokers, when you book a move with us, you’re working with us and our equipment. Cassidy’s will make sure your move – residential or commercial – is a good experience. Cassidy’s often donates time, money, and even our moving services to charitable organizations in the Ottawa area. We’ve offered moving services to the families of Habitat for Humanity. We sponsored the Paul Rushforth Charity Golf Tournament. We shipped donated clothing, toys, and everyday essentials to low income families in Thunder Bay. You can read more on our Cassidy’s Cares page, and keep up with our latest efforts on our blog.